Neon pouts were the big head turners at Chanel’s Resort 2016 collection shown in Seoul this week. 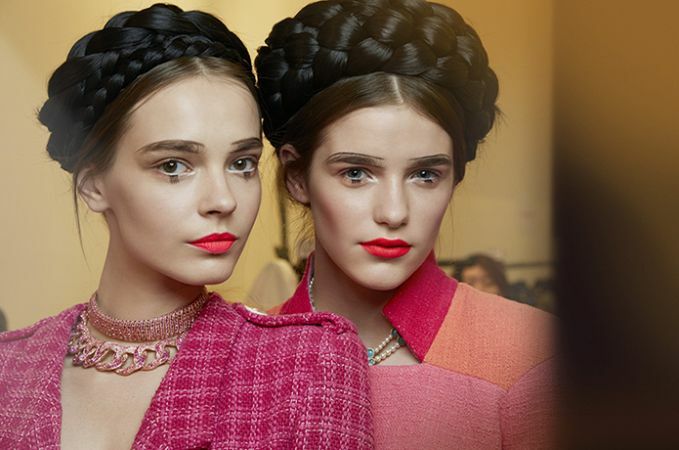 Inspired by Eastern beauty trends, such as cartoon characters similar to manga kewpie dolls, this season’s Chanel beauty look was bold and especially bright. Hair was piled in top braids and faux eye lashes were laid both on the top and bottom eyelids without natural-blending, including an icy shadow dusting near the inside of the eye. Brows were strong and half coloured-in. Runway makeup usually takes the high road and aims to look as natural as possible, but this look was blatantly unreal. Brave, artistic and exciting – it surely inspires some experimentation in our book!